The planning and management of programs and large projects is inherently difficult, not only due to their complexity, but also because something almost always goes wrong (Murphy’s Law!). By combining the flexibility of a general-purpose and highly-graphical probabilistic simulation framework with specialized features to support financial modeling and scenario analysis, GoldSim is ideally suited as a high-level project planning tool suitable during the feasibility assessment and conceptual design phases, while the exact scope of the program is still in flux and it is critical to simulate the range of possible outcomes. 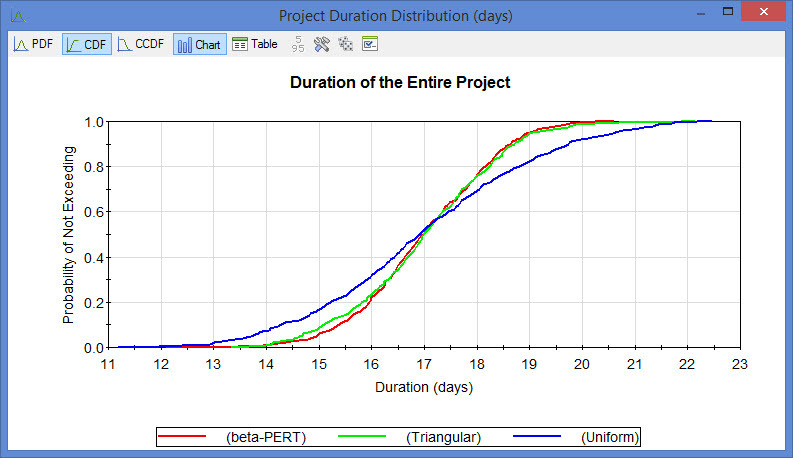 A few years ago, a fellow blogger developed a simple project simulation example that incorporates Monte Carlo simulation in order to show risks involved in project planning, which is posted on his blog, quantmleap (Shim Marom, Telstra - follow him on Twitter). I felt it would be informative to compare this example to a similar model built in GoldSim. It turned out to be very easy to build thanks to Marom's well written description. In addition, I was able to add some financial aspects to the model fairly quickly. 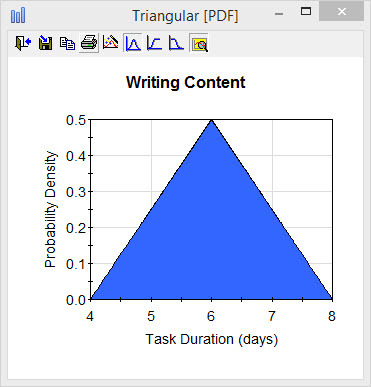 Each of the 3 containers above represent a standalone task with a given start trigger and duration. The 3 tasks operate in series, where the next task must wait until the previous one is complete before it begins. 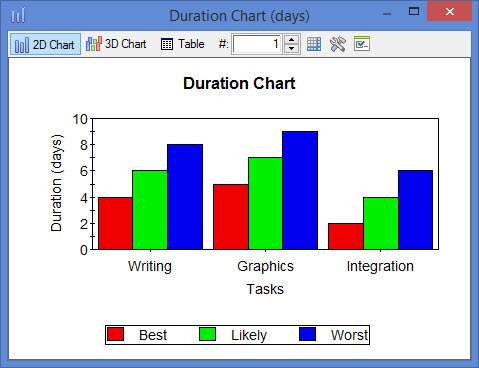 Note this is a very simple type of project, used to demonstrate the most basic modeling approach. 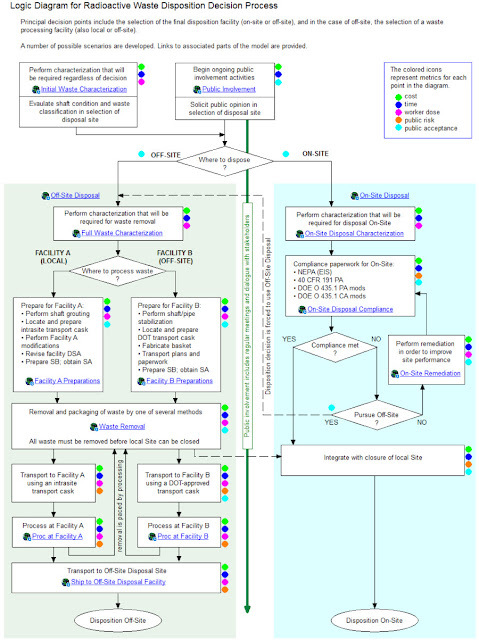 GoldSim can be used for much more complicated projects that involve custom sequencing, random events, parallel tracks, decision trees, and much more. 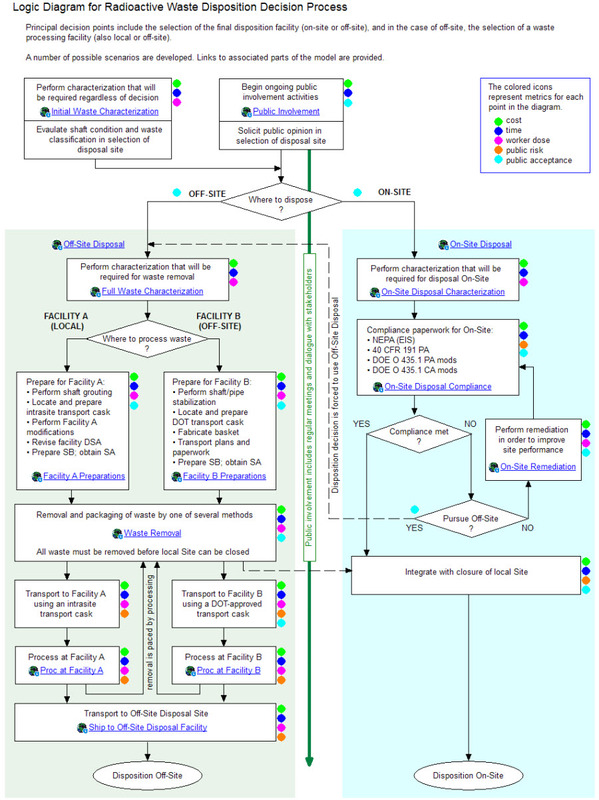 A good example of the type of large scale projects being simulated using GoldSim is described in the "Risk-Based Performance Assessment of Large Projects" article, mentioned at the end of this post. 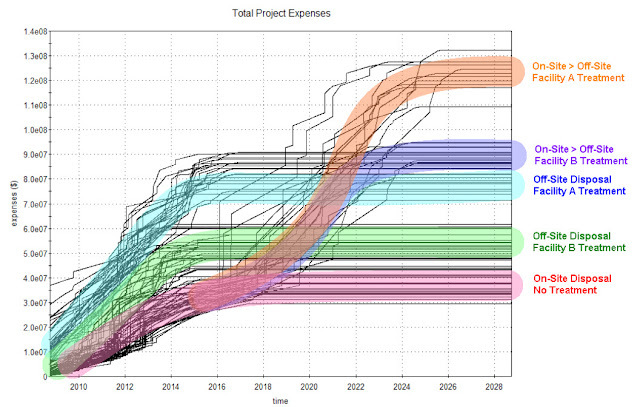 We can also look at the range of project costs for the different scenarios, as shown in the plot below. This indicates that if everything goes well, we could spend as little as $14,000 but could also be as high as $27,000. Please let me know what you think of this model (or the others reference above) if you get a chance to review it. The GoldSim simulation software is used for this risk assessment process because it is a sophisticated state-of-the-art tool with all of the elements necessary for strategic management and financial decisions. GoldSim is accepted and validated by the Nuclear Regulatory Commission (NRC) and has been adopted as the tool of choice for performance assessments of both public and private radioactive waste repositories. Use of GoldSim is a crucial factor in the Process because it provides a tool to manage the inevitable requests for more information from regulators and permitting authorities. 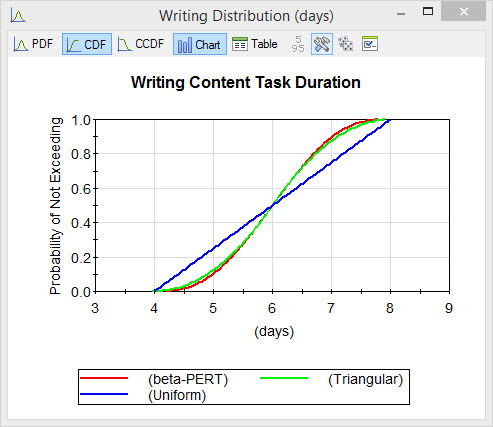 A GoldSim simulation model produces probability distributions of the ultimate goal of success. It also assesses subsidiary goals such as receiving necessary permits, and total project cost and schedule. These actions will improve the quality of executive decisions regarding the cost effectiveness of various steps modeled in the process. It provides a master project plan, which has proven useful for assessing project performance through time. 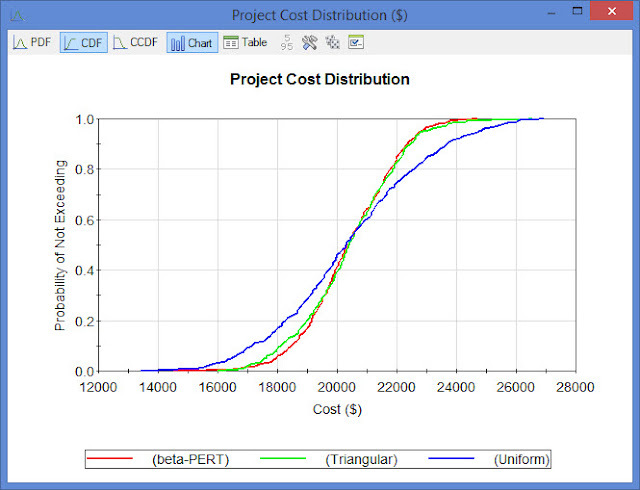 It also allows comparisons between alternative approaches to the project. 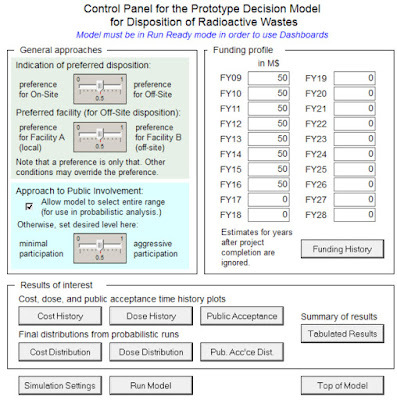 Below are screen captures from the article, showing the decision process, the graphical user interface to the model, and some key results. 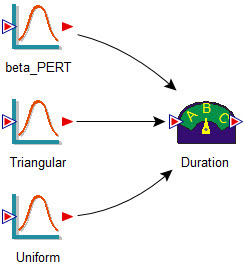 Control Panel for selecting user-definable options. 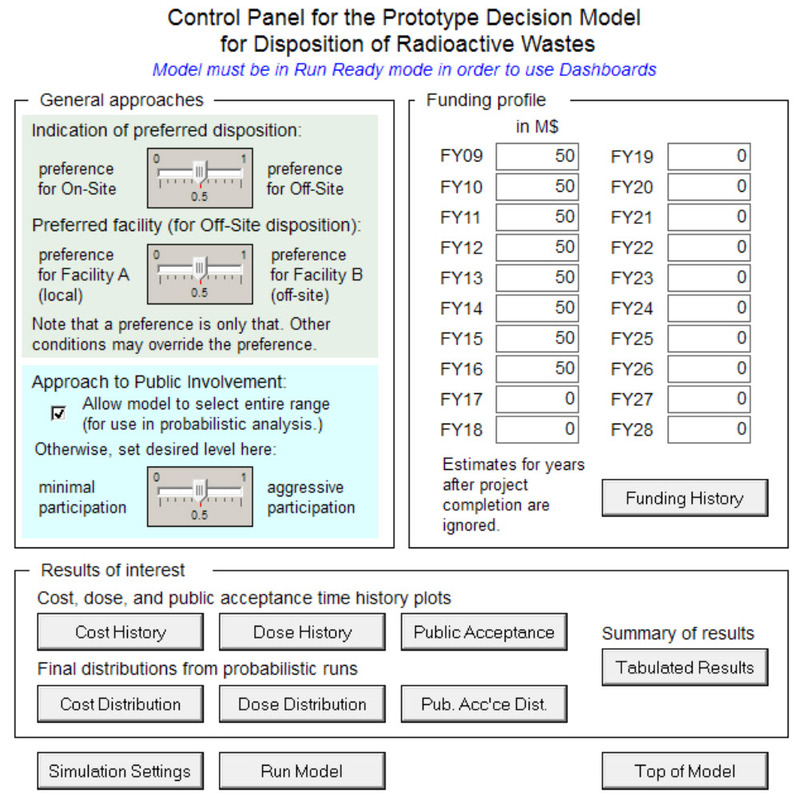 Sample output of realizations from the decision model, showing the final costs related to various decision paths. 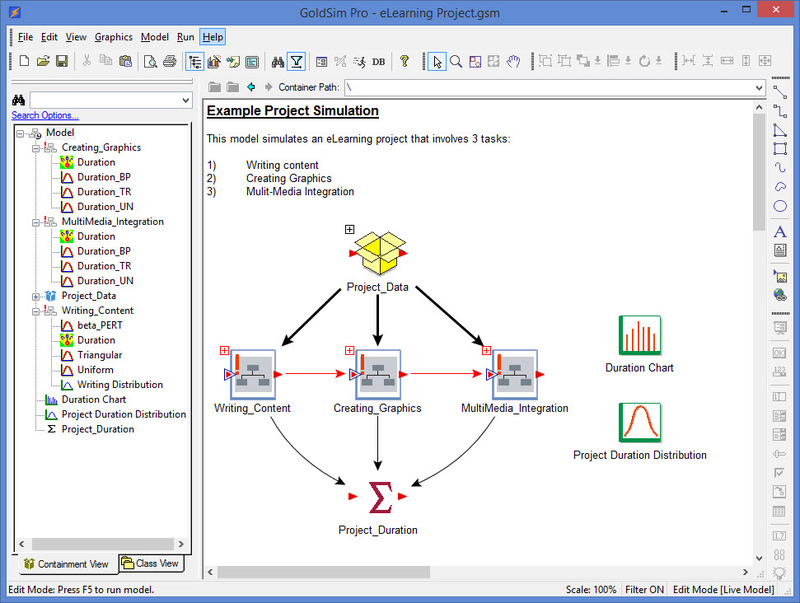 You can also view a video recording of a recent webinar that introduces project simulation in GoldSim, which is saved in our past Webinars page. You can also download the video recording here.